A crafty designer takes a piece of sheet metal, cuts it into a rectangle with rounded angles, punches 4 holes, and paints it with a powder coating for a quality finish. And voila! 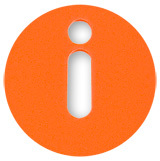 Infoboard is at your service. First of all, you must choose one (or more) of the 4 appealing colours and models. 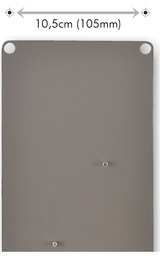 Each notice board measures 35cm high by 12cm wide (and 1mm thick). Three panels attached vertically offer more than one metre of space for posting photos, precious scraps of paper, newspaper clippings, as well as writing your shopping list directly on the board with a felt pen. 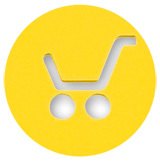 The yellow board features a cut-out that encourages you to write down your shopping list. The orange model features an information symbol, for writing down vital facts like the babysitter's telephone number or your mother-in-law's birthday. 3. magnets with hooks (metal surface like a steel door, a beam, or an iron or steel radiator), with a maximum of two panels hooked together for two large hooks. 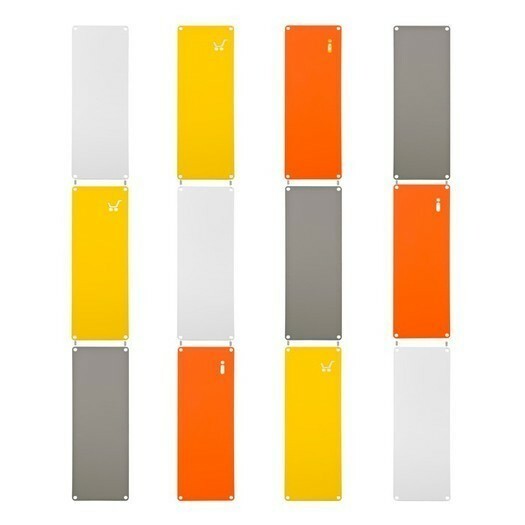 We love magnets: the are fun, practical, durable, and varied. The only limit with magnets is that they require a ferromagnetic surface in order for their magic to work. We all have a place like a part of a wall, a narrow strip or a pillar that we'd like to use, but most objects that we'd like to hang on it are too big to fit. We all have information to share, or important documents that we want to have accessible: shopping lists, telephone numbers, prescriptions, theatre tickets, instructions for the cleaning lady or the nanny, small photos, postcards, dry cleaning stubs, etc. 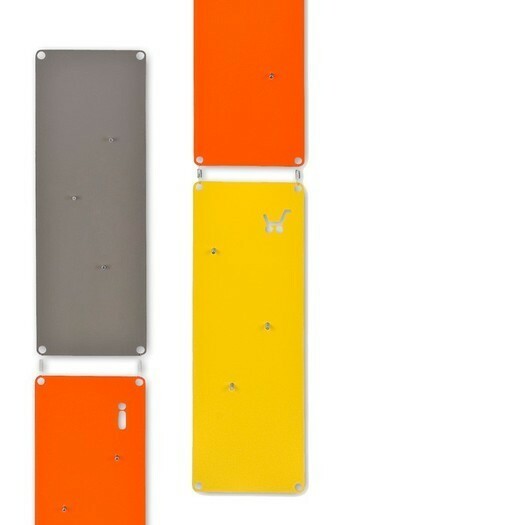 Imported from Germany, these small, modular, steel panels are very compact and you can always find a place for them: they can be hung together with the help of 2 small spring hooks (each panel is delivered with 2 spring hooks) which let you hang them one above the other for more wall coverage, or you can place them according to their function. 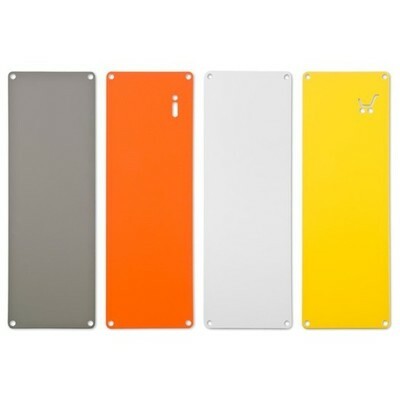 quality - made in Germany with sheet metal and powder coating. German quality, simple and functional, the way we like it. versatility - erasable felt pen fans will find a place to express themselves, as will magnet maniacs, who can post their newspaper clippings, train tickets, and all other important scraps of paper. Those who prefer to test a product before investing (like us) can buy a single panel, fall in love with it, and then add other colours later. striking simplicity - Infoboard is all about simplicity in form and colour: a narrow rectangle with rounded angles is always pretty, no matter what kind of decor you have. The cut-outs are simple and elegant. Warm or cool colours, or both—its up to you!